This important book offers discussion about a man whose accomplishments were ignored for far too long. Heidt and Lackenbauer’s grasp of the existing literature is extraordinary, their judgements are prudent, and the story is fascinating. 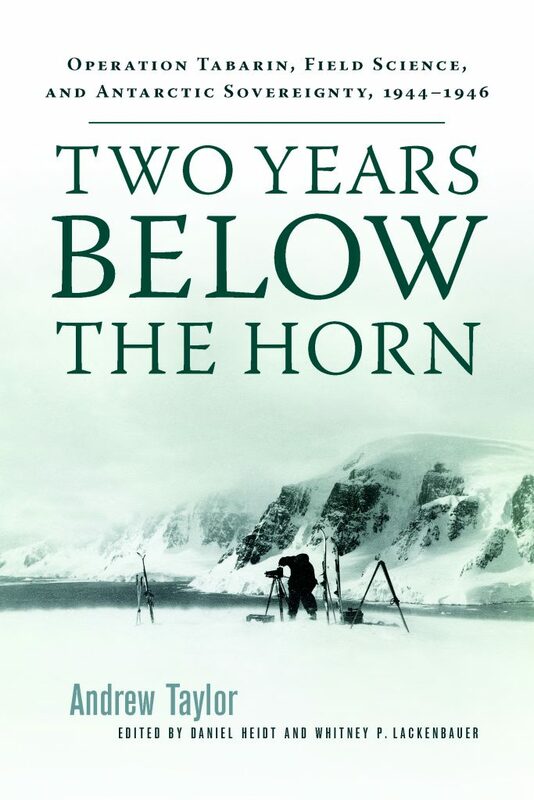 In Two Years Below the Horn, engineer Andrew Taylor vividly recounts his experiences and accomplishments during Operation Tabarin, a landmark British expedition to Antarctica to establish sovereignty and conduct science during the Second World War. When mental strain led the operation’s first commander to resign, Taylor—a military engineer with extensive prewar surveying experience—became the first and only Canadian to lead an Antarctic expedition. As commander of the operation, Taylor oversaw construction of the first permanent base on the Antarctic continent at Hope Bay. From there, he led four-man teams on two epic sledging journeys around James Ross Island,overcoming arduous conditions and correcting cartographic mistakes made by previous explorers. The editors’ detailed afterword draws on Taylor’s extensive personal papers to highlight Taylor’s achievements and document his significant contributions to polar science. This book will appeal to readers interested in the history of polar exploration, science, and sovereignty. It also sheds light on the little known contribution of a Canadian to a distant theatre of the Second World War. The wartime service of Major Taylor reveals important new details about a groundbreaking operation that laid the foundation for the British Antarctic Survey and marked a critical moment in the transition from the heroic to the modern scientific era in polar exploration. Andrew Taylor, Two Years Below the Horn: A Canadian’s Experiences in Antarctica, 1944-1946, Edited by Daniel Heidt and P. Whitney Lackenbauer (Winnipeg: University of Manitoba Press, Forthcoming 2017), 480 pp.